Lhasang with the Sakyong, Sakyong Wangmo and His Eminence Namkha Drimed Rinpoche. On Shambhala Day and at other auspicious times, we often gather outdoors around a fire, or indoors around a brazier of glowing charcoal. Chanting verses to the dralas, or nonvisible wakeful energies, we offer juniper and other substances, creating a column of smoke through which the dralas can descend. Chanting KI KI, SO SO ASHE LHA GYE LO TAK SENG KHUNG DRUK DI YAR KYE!, we circumambulate the fire, carrying banners and smiling in the bright air. This ceremony is called the lhasang, the divine purification. It is a ceremony of meeting and joining the magic of the warrior’s world. In Shambhala, goodness is not only communication between humans; it is also communication with the elements and all living beings. This is known as drala, the natural communication that is always happening in our environment. The tides changing, the birds singing, and people kissing are living signs of the innate wish to communicate that percolates in all relationship. It is this warmth that binds us. The dance between the elements and our perceptions is a dance between the masculine and feminine principles: Our senses are always engaging with our environment. This, too, is enlightened society — the pure, clean communication of the living world. In China, Confucius and Mencius introduced the principles of power in joining heaven and earth. “Heaven” was vast spaciousness—power that arose from the highest place, goodness. “Earth” was the resources at hand— nowness. It was humanity’s duty to join these two in a harmonious society. This was called “cultivating the Way”. The vehicle for doing this was virtue. Using patience not anger, exertion not laziness— virtue comes about from being on the spot. As my father put it, “You should have the honorable decency to keep your nowness. It is up to you.” In the current modern system, it seems that our vehicle is not virtue but materialism. Although we never lose basic goodness, under these circumstances, we have lost our heaven and earth. We are experiencing an air of instability and anxiety because our power is grounded in superficial principles. 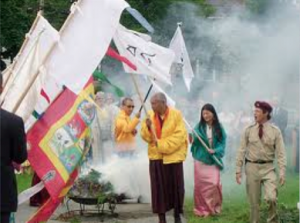 Joining heaven and earth is at the heart of being a Shambhala warrior. We often hear phrases like this, but perhaps we have not considered the depth of what they point to. We may think that heaven is like vision or mind, and earth is like practicality or body, and so “joining heaven and earth” is really just joining our visionary planning with the practicalities of the manifest world. Of course, this is quite right, and fits in our reasonable domestic way of thinking about ourselves. But when we look deeper, we discover that joining heaven and earth is impossible without a magical relationship with the world. The metaphors for heaven and earth are overwhelming when we consider them: heaven, like the sky, is infinite, without center or fringe, full of brilliant heavenly bodies like the sun and moon. It has no color, shape or form, but is full of powerful energy, and from it clouds form and reform in a vast blue atmosphere. Likewise, earth is what we walk on, but it is also the stuff of everything, the elements that compose the world and the body. Earth is solid, endless, an infinity of interdependent relationships. When we join heaven and earth, we are not just planning a menu and cooking a meal, or making a business deal. During a lhasang we embody the magical place between these two primordial poles of our existence. The energy of this embodiment is called lungta, windhorse, and manifests for all to see as wangthang, authentic presence. It requires bravery to touch the primordial world of heaven in everything we do in the practical world of earth, but this is the way we can develop the vast vision and power required to create enlightened society. Just as lightning illuminates the darkness of a cloudy night for an instant, in the same way, by the power of the Buddha, occasionally people’s minds are momentarily inclined toward merit. , in order to invoke the ancestral forebears. We cannot hold thunder and lightning in our hands, so we need other means to connect Heaven and Earth. How do we invoke the sky and embody earth without diminishing their beauty, power, and ruggedness with our conceptual minds? How can we leave them inconceivably big and full of magical energy, and yet directly join them in our human realm? Ritual and ceremony save us from having to rely on concept to understand what we are doing, or explain what we mean. When we perform a ceremony we enact what we mean. Having performed our ritual, we can see what we are invoking in this very present moment. When we perform a heartfelt ceremony or ritual, we cannot distinguish the symbolism — the chant, the gesture, the shrine — from what it symbolizes. In fact, ritual is always how we join heaven and earth in our lives. Even pouring ourselves a glass of water can be a simple ritual of dignity and delight. Without warriorship and lungta, our lives become empty; ritual is the magical language that invokes, awakens, and reminds us of our inherent goodness and courage. Of course, if we just go through the motions, we don’t find much magic; but if we have sadness and longing in our heart, it is as if electricity goes through the ritual, and, to our surprise, heaven and earth are joined. We need a genuine heart of sadness, and deep trust in our tradition — our way of connecting heaven and earth — to make a lhasang vibrant and alive. But it is so strange! So alien! Who are these dralas, anyway? Almost all of us in modern culture are trained not to trust ritual and religion. They are dismissed as primitive, unsophisticated superstition, foreign, bogus, and just plain weird. However, throughout human history, wise people have used these tools to bring the natural wisdom of heaven to earth. If we respect what they achieved and understood, we can dare to explore the power of ritual with an open mind and heart. How do we move from doubt and hesitation about a ceremony like the lhasang to being able to fully identify with the magic it invokes? How do we learn to accept the invitation it offers to enter the sacred world of drala that is always present, but so often unseen? This quote from the Sakyong captures the essence of opening to the magical dance of lhasang. As student-warriors, we are gradually opening up to trusting basic goodness — in ourselves, others, and in human society as a whole. When we acknowledge that goodness is the ground of all, we can let go of the mantras of the setting sun: “I am not a worthy person,” or “people are basically selfish,” and proclaim the mantra of wakefulness: KI KI SO SO! The more confidence and trust we feel, the more our hearts soften, and we become sensitive and open to the magic of the world. That vulnerability and openness — scary is it is — allows us to invite the dralas to descend the ladder of smoke in our lhasang. Then the earth feels firmer, the sky is bluer, and we can ride the bright air of the present moment together. Who are the dralas we invite with our lhasang? One of the main ones is Gesar of Ling. Gesar manifested in Tibet at a time of great chaos and degradation. He is regarded as the best example of the enlightened warrior, in that he was able to defeat the enemies of setting sun society and life that were destroying Tibetan culture in his day. These enemies — selfishness and bias, the conmanship of materialism, chasing pleasure, and using efficiency to justify ignoring sacredness—are all with us today as well. Gesar’s adventures and exploits are chronicled in the Epic of Gesar, the first part of which was translated by our own Robin Kornman (The Epic of Gesar of Ling, Gesar’s Magical Birth, Early Years, and Coronation as King). Trungpa Rinpoche said, “Gesar represents the ideal warrior, the principle of all-victorious confidence. 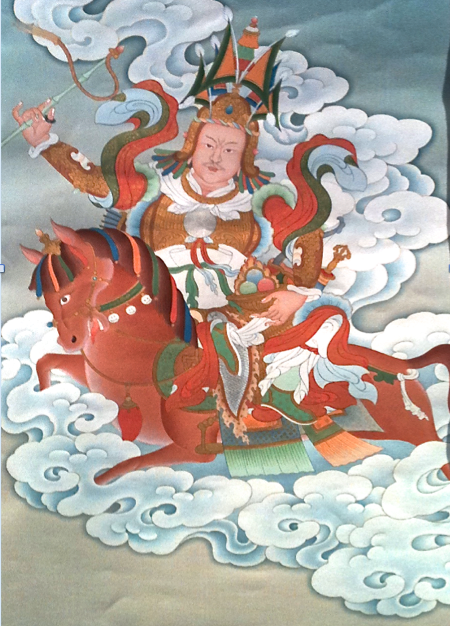 As the central force of sanity he conquers all his enemies, the evil forces of the four directions, who turn people’s minds away from the true teachings of Buddhism, the teachings that say it is possible to attain ultimate self-realization.” During the lhasang we visualize Gesar as drala, a personification of the bravery that empowers us to overcome the degraded seduction of the dark age. Dralas like Gesar have images, stories, power, characteristics, and even personalities, so to speak. The Warrior Song of Drala, the Long Werma Lhasang, is an invocation of Gesar and his retinue of fearless warriors, inviting that fearless energy into our lives. It is said that it is not possible for us to create an enlightened society if we cannot imagine it; likewise it is impossible for us to meet the challenges of modern life as warriors if we cannot imagine the bravery and strength that allows us to manifest basic goodness in every aspect of our lives. Gesar and his retinue enable that imagination, an actual image of bravery embodied. At a lhasang, we visualize him in the immediacy of the juniper, fire and smoke that rises to connect heaven and earth in the vivid moment of now. The power of nowness galvanizes the mental image of Gesar and his retinue with the power of basic goodness. We make offerings of juniper, joyful voices, and the dance of life around the fire to celebrate the presence of warriorship in our lives, as a community of ordinary people with good heart and great aspiration to benefit others. Our friends the dralas are delighted to join us at the lhasang! May it be of benefit! Thank you very much for this beautiful and profound article! Wonderful article. Perfect timing. You two are the best! Thanks to Luz Rodriguez for making this available!